TERRIBLE TUESDAY! : MEMBERS OF HORNSS & BLACK COBRA IN STUDIO ON TERRIBLE TUESDAY 4-6PM PST ON RADIO VALENCIA! MEMBERS OF HORNSS & BLACK COBRA IN STUDIO ON TERRIBLE TUESDAY 4-6PM PST ON RADIO VALENCIA! On tomorrow's Terrible Tuesday Radio Show w/Naked Rob, San Francisco's own HORNSS will be in studio. We'll be talking about their new record, their upcoming record release party this Saturday, May 24th at @Bender's Bender's Bar and Grill and more. Also on tomorrow's radio show, Rafa of black cobra will be in studio. 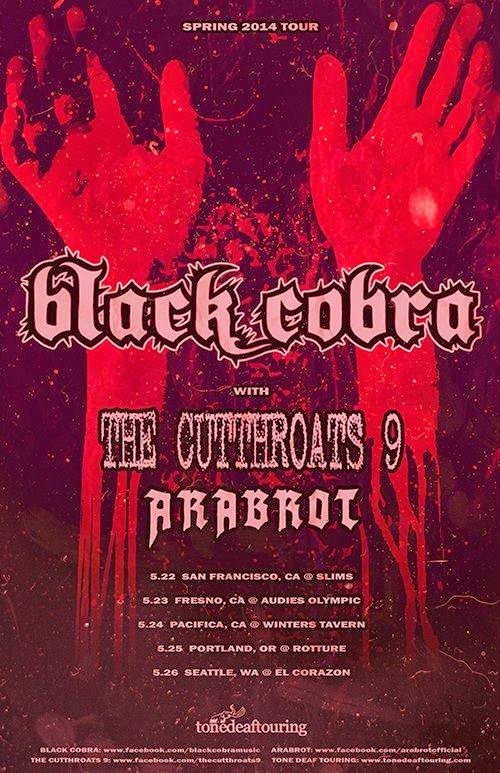 Black Cobra will be sharing the stage along with The Cutthroats 9 this Thursday, May 22nd at Slim's and going on a Northwestern tour right after. Also, The Cutthroats 9 has a new album coming out on Chris Spencer's record label, Lamb Unlimited and the CD on Reptilian Records. Check out the radio show tomorrow, 4-6PM PST, May 20th on Radio Valencia in San Francisco, California or listen online at www.radiovalencia.fm. LET'S ROCK!